1) We all know that I have stiff straight cow lashes right? of course, I have to add that they are also short. I am oh so blessed! (do you sense the sarcasm?). So I am usually more of a false lash girl than spending my time relying on mascaras. However, I have a new found love with Benefit's They're Real! Mascara. The brush is the perfect size and at the end of the brush is like a little spiky ball that makes it easy to coat individual lashes. It certainly gives me length and is great on its own but when I layer it on with THE ROCKET it is perfect. REVIEW WILL BE UP SOON 2) In my September favorites I was obsessed with Revlon's Raspberry Pie lip butter, still am but I have also been loving butter Revlon Lip Butter in Red Velvet (SWATCH HERE). It's a beautiful muted red, it's neither too bright or too dark. It's right in the middle which makes it perfect for fall! You can darken it by putting on a darker lip liner or brighten it by adding a bright lip-liner. This lipstick is very versatile. 3) I have been on a lipstick craze lately and came across Wet n wild's Ferguson Crest Cabernet. It's a beautiful deep burgundy/plum wine color and is completely opaque. For $3.49 it's perfect. I hear its a dead on dupe for Mac's Rebel but I think Ferguson is a little darker. 4) Another lipstick I have been loving for fall is Wet n wild's Vamp it Up. It's a beautiful vampy color, certainly not for everyone but I LOVE IT! It's a very dark purple lipstick, almost black but you can just see that hint of purple in it. It does tend to stain the lips after wear but for $1.99 I can't complain. SWATCHES OF BOTH LIPSTICKS WILL BE UP SOON 5) I contemplated whether or not to add this into my favorites because Philosophy discontinued this product but I have been using this everyday in place of BENEFIT'S HIGHBEAM. The Heavenly Light Pink Illuminator is so pretty and gives a beautiful glow to the face without looking shimmery. It's very subtle, helps give a dewy look to the skin. Thank's Melissa for gifting this in the swap! 6) I have given up on regular eyelash curlers and the heated ones seem to use up so many batteries but at last I discovered Shiseido's Eyelash Curler. I don't know if it's because it is brand new or because it actually seems to fit my eye shape. This eyelash curler is not as curved as other ones it is actually a bit flatter, making it easier to grab my lashes and properly curl them. REVIEW WILL BE UP SOON 7) Catwalk Queen (SWATCH HERE) pairs perfectly with the vamp it up lipstick. It's a deep almost black purple with subtle sheen and some gold glitter. It's perfect for people that want to go dark but don't want to go completely black. 8) Scandalous (SWATCH HERE) is a mixture of purple glitter in different sizes with a black base. 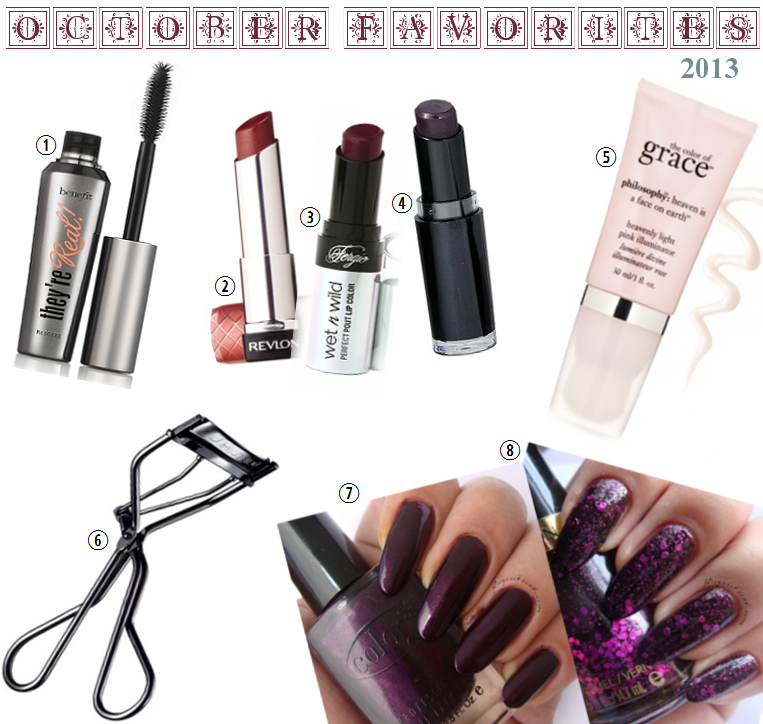 It's great to lightly glam up a dark nail look. Due to the black base the purple glitter isn't as vibrant as it can be but it shines through just enough. Thick pita bread and curry! 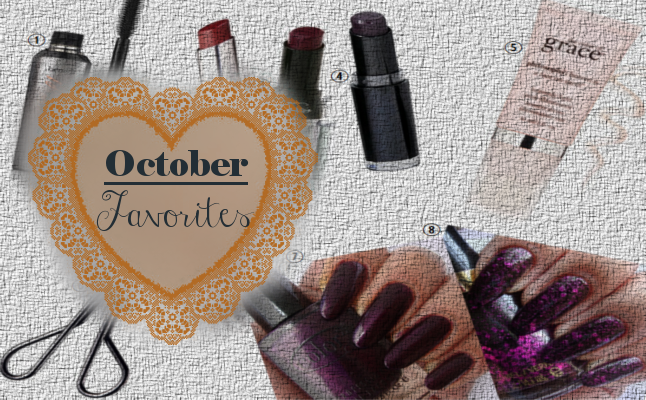 That's it for my October monthly favorites. I hope you enjoyed! Feel free to share some of your favorites in the comments section below! I would love to know what staples you have this month. Wow your nails look amazing!!! Thanks for following my blog from the blog hop, I am now following back! One of my recent favourites is "Sugar Plum Fairy" by wet n wild (pretty similar to Ferguson CC). yay I hope you like it as much as Sugar Plum Fairy! I own that one as well! I think FCC is a little bit darker but they are very close in color.